The problem of attending a classical music concert for a newcomer is a real one but is based essentially on a misunderstanding. The popular conception of classical concerts, perpetuated by Hollywood and others, as hoity-toity social affairs, bears little resemblance to reality, especially these days. Furs and monocles are optional. When I started out as a staff music critic at a newspaper, I would usually wear a suit and a tie to concerts. But what I soon found was that nine times out of 10, I was overdressed. These days the suits and ties generally remain in the closet; I’d rather not be noticed. If you are a classical newbie and would similarly like to blend in, then “casual dress” is the safest bet. Shouting bravo and booing (it happens) will come later. They are the property of connoisseurs. Wait until you get there. 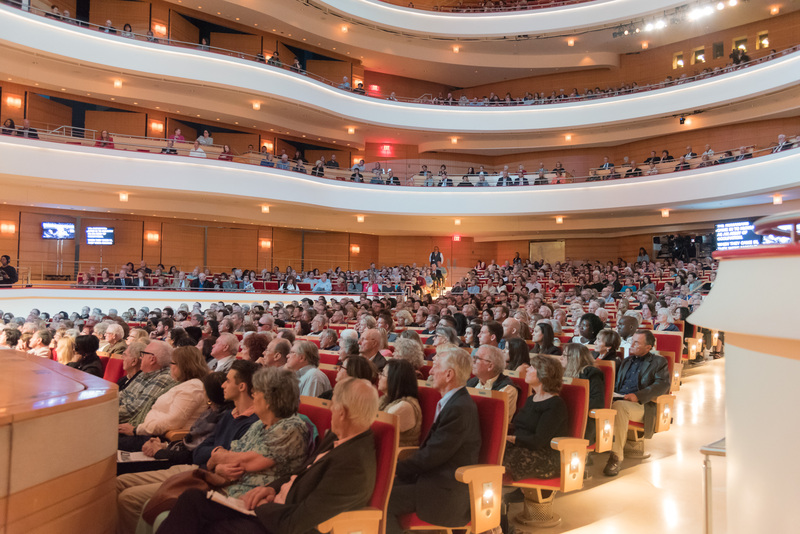 In theory, the standing ovation should be reserved for only the most exceptional performances, but in practice almost every classical concert ends in one and there’s not much you can do about it except gruffly refuse to stand, or, stand and join the fun. This entry was posted in classical music and tagged applause, etiquette, symphony by pacificsymphony. Bookmark the permalink. Is drinking a beer during a performance bad form? I know you’re joking, but it actually depends. There are some classical groups these days that are giving concerts with cocktails and beer. In fact, the Pacific Symphony is presenting a concert at OC Center for Contemporary Art on June 29 and beer and wine are served. When I was a 6th grader in the Long Beach public school system (oh so many years ago), we were given the opportunity to attend a performance by the Long Beach Symphony. At the time, Murray Sidlin was music director. A few days before our visit, we watched a public access TV program led by Mr. Sidlin which helped prep us for the concert experience. It was well done, informative yet cheeky enough to keep the attention of older elementary school kids. FWIW, that “wait until the conductor turns around” rule has worked rather nicely and definitively ever since. Great and much needed post – hopefully they will include some of these tips in the programs. The last two times we have attended we were seated by individuals who persisted in talking during the performance – often during the quietest movements. The clapping between movements is a bit embarrassing but I could live with that if I didn’t have to be concerned about persistent talking. Next time I will have one of the ushers intervene. Thank you so much for this. Definitely sharing. I echo the frustration of the commenter above re audience members talking during the performance. People forget they’re not at home watching TV… On the subject of applause, I had a music professor who described the pauses between movements as a kind of sacred space that allows both performers and audience to fully absorb what they have just played/heard, and then to prepare themselves for what is to come. This teacher noted that the pauses are, therefore, part of the music, but they are silent music. “We listen to the music and to the silence… ” adding “that’s why the words listen and silent are made from the same letters.” He recommended that if one isn’t sure when to applaud, best rule to follow is to wait until the conductor turns around and bows.